The most creamy and delicious homemade garlic alfredo shells topped with crispy parmesan garlic chicken. This is an absolutely fantastic meal that will instantly become a family favorite! There are some recipes that I get so excited about sharing with you. This recipe is one of them! I took some of my favorite things from some of my best recipes on the blog. I combined it in this dish and the result was incredible. First I started with my favorite alfredo sauce base. It is the creamiest most delicious homemade alfredo sauce that you will make. I added some minced garlic which added some garlic flavor to it. It tasted just like it came out of a restaurant. Creamy and delicious. It was so easy and so good! I chose pasta shells because my kids love them. And the garlic alfredo sauce coated them perfectly. Oh my goodness. These were so yummy! But then it gets even better. The crispy parmesan garlic chicken on top is phenomenal. The chicken gets dipped in a buttery garlic and then coated in a crispy parmesan garlic coating. Doesn’t that sound amazing?! 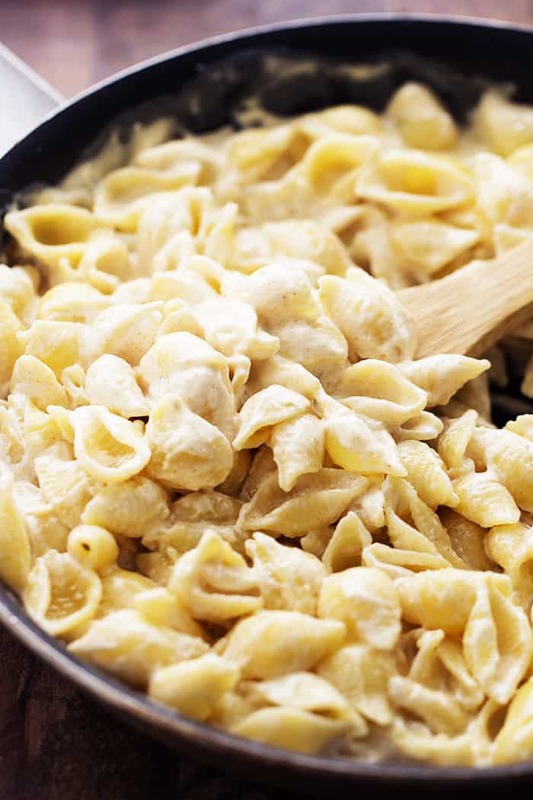 The crispy coating on the outside goes so perfectly with these garlic alfredo shells. The crispy outside flaked over the shells and added such AMAZING flavor! As soon as my family had the first bite they couldn’t believe how good it was! I know that you are going to love this meal as much as we did! It is truly a 5 star meal that you can make right at home and the family will devour it. Put it on the menu for this week. You won’t regret it! Preheat oven to 425 degrees. In a shallow bowl combine melted butter and garlic powder. In another shallow bowl combine bread crumbs, shredded parmesan cheese, oregano, and parsley. Dip the chicken into the melted butter and then coat in the bread crumb mixture. Place on a greased baking sheet and bake for 15-20 minutes or until chicken is cooked throughout and no longer pink. Meanwhile, cook the pasta shells until al dente. In a large saucepan cook the heavy cream and cream cheese together until smooth and cream cheese has melted. Add garlic powder, minced garlic, pepper, and salt. Lastly, whisk in the parmesan cheese. Continue to cook over medium heat until heated throughout. Add the cooked pasta shells and toss until coated. 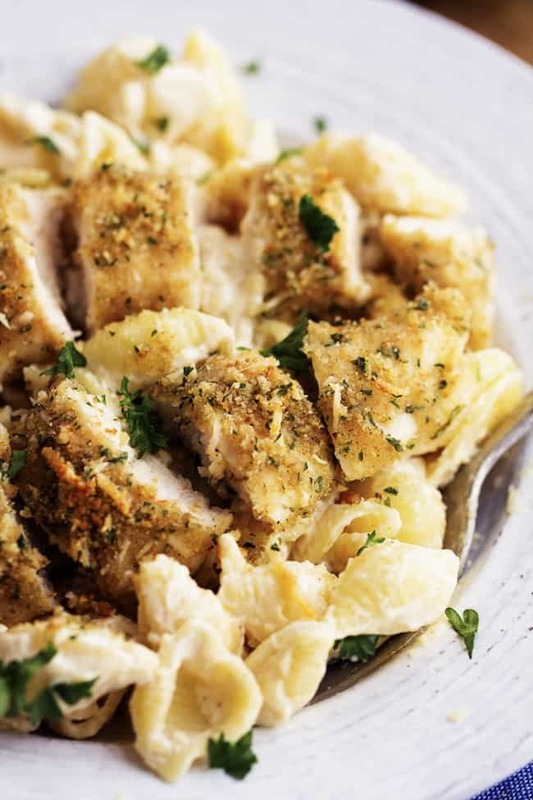 Serve immediately with parmesan garlic chicken chopped on top. Garnish with fresh parsley. I’m literally sitting here, swooning over these pictures! This needs to go on our menu plan ASAP! Now THIS is comfort! Yum! This dish looks delicious! Just a couple of questions – Could you tell me approximately how much of the boneless skinless chicken breasts (in lbs.) to use – it seems that 4 of these breasts would yield more that 6 chicken tenders? Also, the shredded parmesan cheese that is used for the chicken coating – is that the fresh kind sold in a block? and the grated Parmesan cheese that is used in the Alfredo sauce – is that the Kraft kind in the green canister or the fresh kind? Thank you! We tried this the other night and absolutely loved it!! So much flavor in so little ingredients. It was also so easy. It’s become our favorite! I plan to make it this week. Just one question…..do you use fresh or dried herbs for the chicken coating? This recipe was absolutely amazing. I had to double the recipe to feed a family of six. I used a block of parmesan cheese and I shredded it for the breading and then I use the grated Parmesan cheese for the sauce. I would not recommend cooking this at 425 I cook my chicken at 375 for 45 minutes and then another 15 minutes at 350 to prevent burning the top. It’s pretty easy and tastes delish. Two thumbs up from my picky eater who is 7. Make and enjoy! ??? I used two chicken breasts, cut them into tenders, and increased the pasta and sauce by 30%. IMO I think the pasta & sauce could be doubled for this recipe. The sauce tastes great for how simple it is to make. The chicken though was really soggy on the bottom, and I even used a rack on my baking sheet. I think I would prefer the traditional Kellogg’s cornflake recipe for coating the chicken, and will do that next time. Overall, a quick weeknight meal! I am planning to make this for a potluck for lots of ppl on Saturday, which obviously means I’ll need to multiply each of the ingredients by quite a bit. is there any reason why this dish wouldn’t translate well with increasing the amount of the ingredients? Very very good! Thanks for sharing! I even grabbed a garlic and herb bread crumb. So yummy! Seriously the best alfredo sauce ever! My husband asked me to make this every week forever, and he’s not even a pasta lover! I can’t wait to make it again tonight. 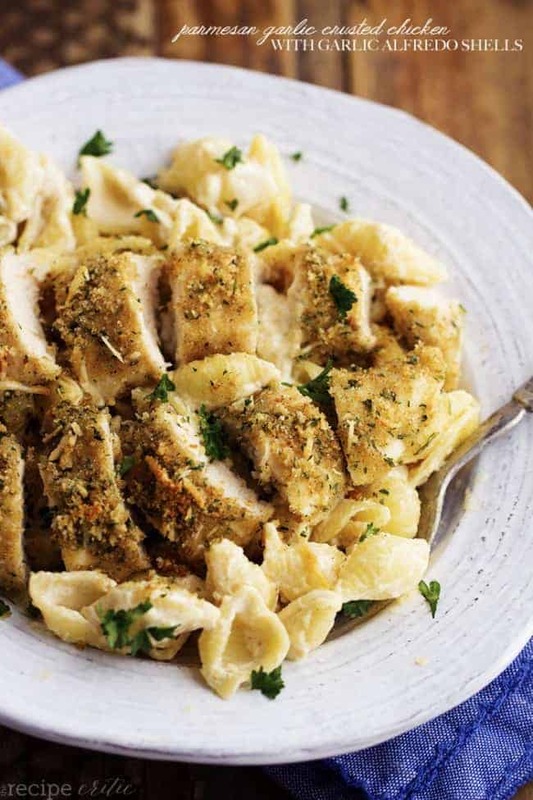 I combined this wonderful chicken recipe with your recipe for “the best homemade alfredo sauce ever” and fettuccini; it was OUT OF THIS WORLD PHENOMENAL!! Thank you so much for a couple wonderful recipes that my boyfriend really loved! It will now be a part of my recipe rotation. So glad to have found your site! This was absolutely delicious! Definitely the best alfredo I’ve had. This dish is on my list of favorite meals. Thanks so much! We all thought the sauce was really thick and heavy, and too cream cheesy. Loved the chicken dipped in butter and breaded! It turned out great in 18 minutes at 425. I have everything but heavy whipping cream, what can I use instead? Super dish, not being from the states……..never heard of pasta alfredo but loved it ! I am interested in freezing this dish and baking later. Love this dish! 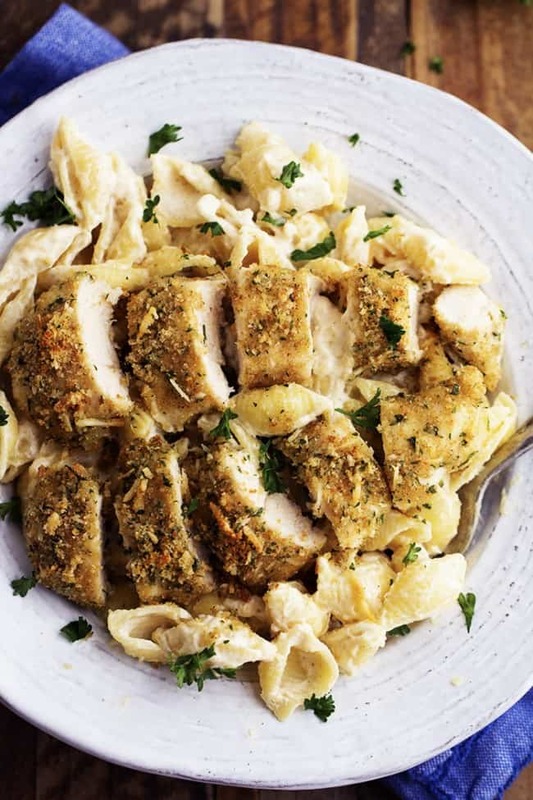 It’s the best Alfredo sauce I’ve tried and it’s super easy. My chicken always comes out soggy on the bottom though or completely falls off.. any tips on how to fix that? HMMM! I am not sure why it would be soggy with the breadcrumbs surrounding it and it is being baked alone with no other sauce. I am so sorry that you are not getting the best results. If you tried flipping them during the baking time, would that help?! Quick question. You have 1/2 a cup of butter in your homemade Alfredo recipe, but the only butter I see in this recipe is to dip the chicken. Is it better with or without butter? I’d assume with,but how much? Thanks! I have a question…. I’m a beginner at the kitchen and chicken although easy for many people is not for me. I never know what condiments to put on the chicken before cooking it so it tastes yummy when cooked. Please please help. With this recipe, if you follow the instructions it will help you add the things you need to, to the chicken in order to get all seasonings and such for this recipe. Every recipe is different though.